Vingerklip Lodge, in Damaraland, Namibia, offers travellers the opportunity to walk or hike and view wildlife in the wilds of Damaraland, and the chance to take a breather and relax. 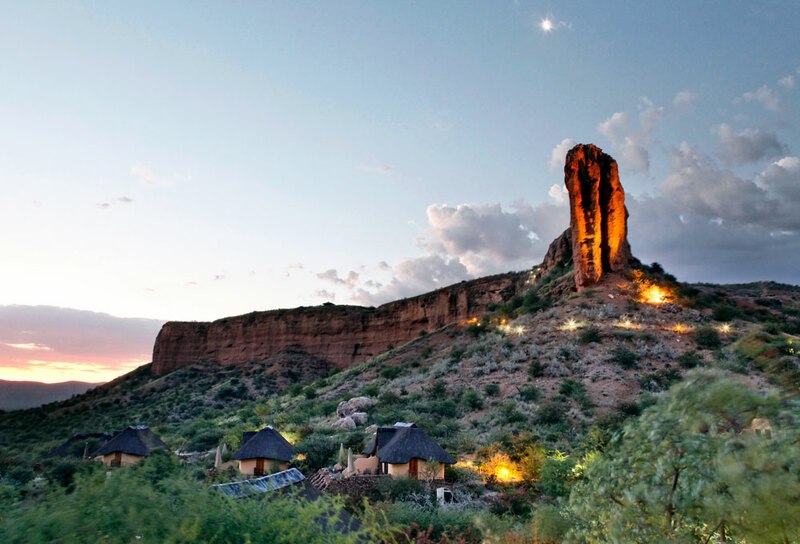 The lodge overlooks a huge pillar of rock known as the Vingerklip, a geological oddity. 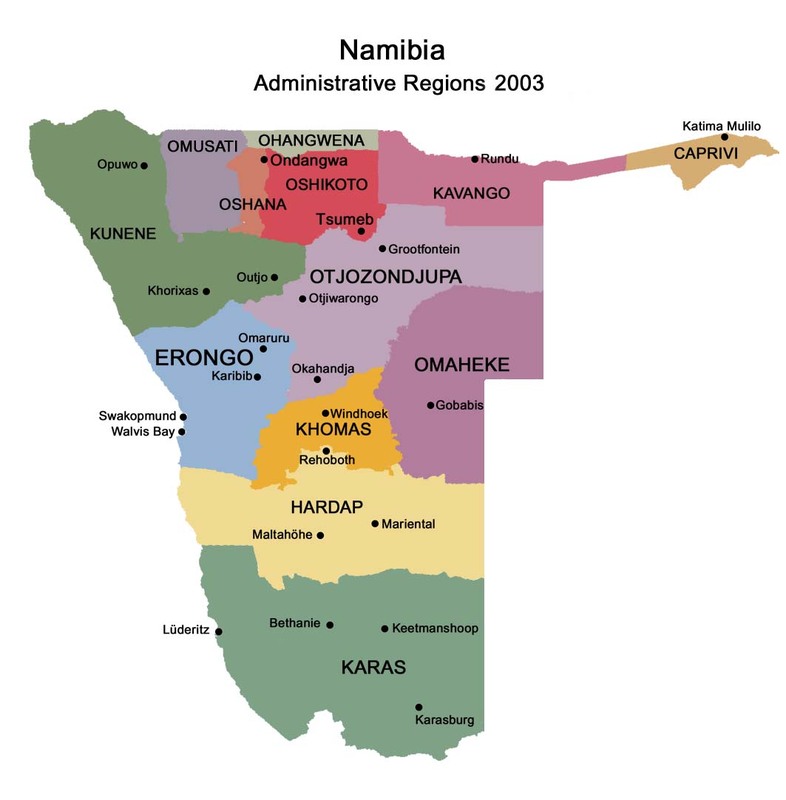 In addition to short walks and hikes, travellers can visit a Himba Village, take a sundowner drive or relax in preparation for the next leg of their journey through Namibia. Vingerklip Lodge has two restaurants, two swimming pools and a Jacuzzi. The sundowner verandah provides exceptional views from a high point above the surrounding landscape. A floodlit waterhole provides game viewing opportunities. Various terraces give travellers the chance to find peace and solitude on their own. Travellers are encouraged to explore the surroundings and relax. 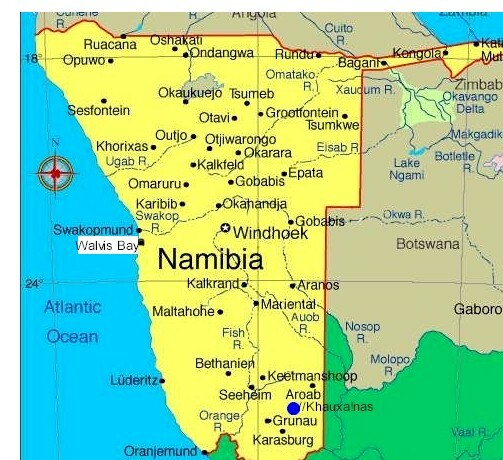 A journey through Namibia can be rushed. Vingerklip Lodge is an ideal place to give travellers the chance to recharge. One of the most dramatic rock formations in Namibia is the 35m high pillar of rock, the Vingerklip or Finger of Stone. It stands proudly above a valley in the ancient landscape known as the Ugab terraces. A place of mystery, wind-sculpted rock and far horizons, it is a nature experience which lingers long in the memory. Nestling in this timeless valley is Vingerklip Lodge where guests are warmly welcomed. A sheltered sundowner veranda affords breathtaking views of the surrounding countryside and the unmatched splendour of a Namibian sunset. Gourmet cuisine complemented by fine wines, and refreshing, locally brewed beer is served by the open fireplace in a spacious dining area. 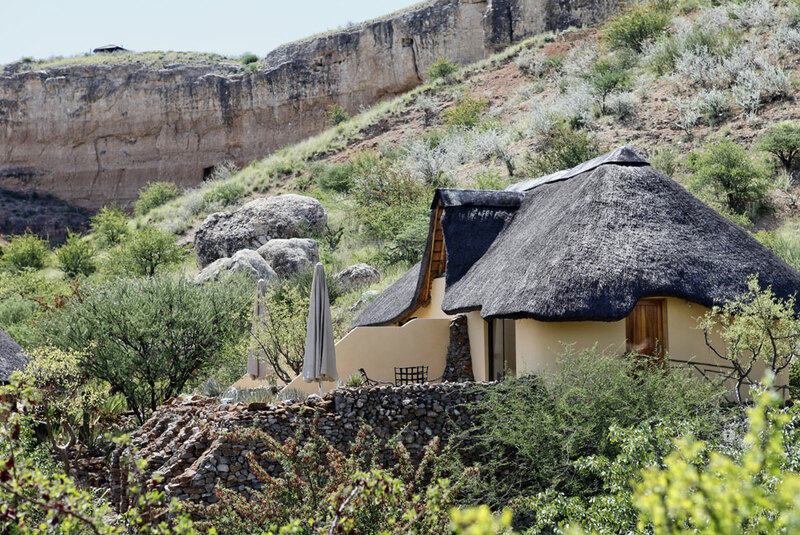 Eleven well-appointed, thatched, double accommodation units match the atmosphere of relaxation and tranquility. For family-style holidays, five of the 22 units offer loft accommodation for two children. Would you like to experience the African Wilderness - the Vingerklip Lodge is the place to be! 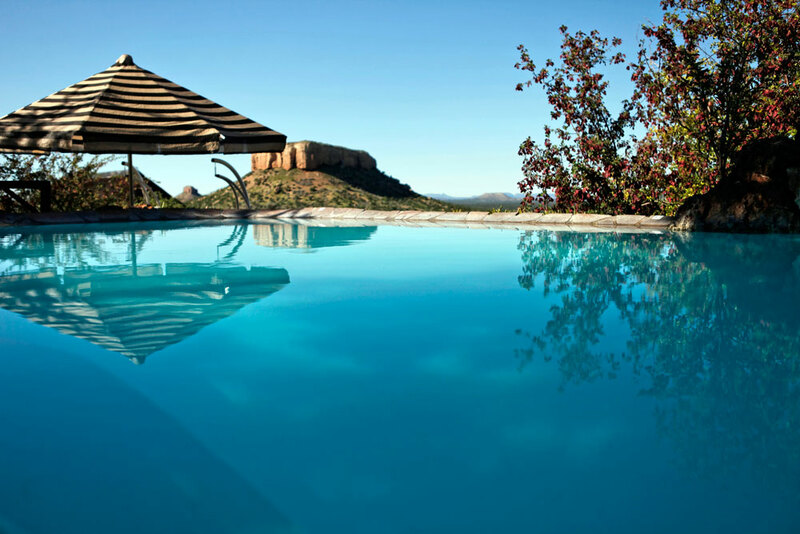 Two refreshing pools invite you after strolling along the trails across the African bushveld. Or enjoy a sundowner on our veranda with a view over Namibia's wide open spaces. At night, enjoy one of the worlds most stunning starry skies, while sitting around the camp fire. Other attractions in the area include: the Petrified Forest where some antediluvian flood deposited giant tree trunks are found; the vividly coloured ridge of hills known as the Burnt Mountain arid the Doros Crater where fossil remains have been found among the rocks. Twyfelfontein is unequalled for its abundance of rock engravings, while the imposing Brandberg massif is home to one of the richest collections of rock paintings in Southern Africa. 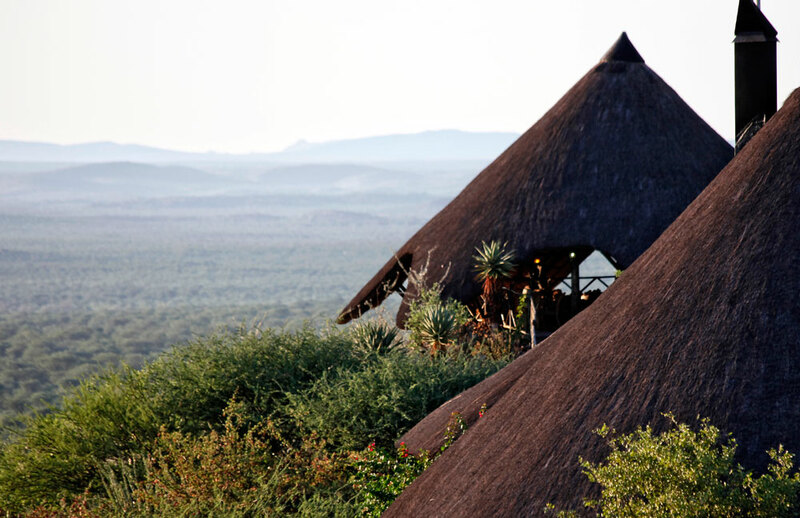 It is easy to reach the Etosha National Park from the lodge. 11 double/twin rooms, 11 family rooms & Heaven's Gate luxury bungalow. Located on a 1,600 ha private reserve between Outjo and Khorixas. The area has a good populations of giraffe, Oryx, springbok, kudu, eland, impala and steenbok. Ideal for self-drives, small groups and families. Located within walking distance of the Vingerklip. Activities include guided and self-guided walks, Himba Village visit and sundowner drive. During rainy season a 4x4 vehicle is recommended. * Vingerklip Lodge can be reached in a 2 X 4 sedan. * Although Vingerklip Lodge lies in an arid area, rain in other parts of the country can cause rivers to flow. The onset of the flow is very rapid. * As a large part of the journey takes place on gravel roads, consultants should switch to a 4x4 vehicle during the rainy season (October to April). Vingerklip Lodge offers free transfers from / to the Vingerklip Lodge Airstrip. Note: Fly over lodge for pick-up. Small detour attractions: Cape Cross and the 'White Lady' rock painting at the Brandberg. NOTE: A visit to the 'White Lady' requires an approx. 2 hours walk. Small detour attractions: Warmquelle and Ongongo. The C38 & C39 are tar road. The D2743 is gravel road. Small detour attractions: The 'White Lady' rock painting at the Brandberg.